Guitarist Edward Box's Vendetta project, and the debut Tyranny of the Minority, was one the great metal surprises of 2007. 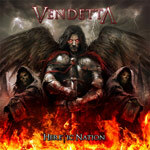 Vendetta returns with a strong second effort in Heretic Nation. This album continues the course Box and company set from the start: crafting guitar driven melodic heavy metal which overflows with energy and enthusiasm. I might insist that Heretic Nation is a tad heavier than the first disc, but that's just first spin impression. Regardless, Vendetta is a metal force to be reckoned with. Box's expert fret work abounds and blisters on Heretic Nation, which will keep all lovers of six pyrotechnics (like myself) quite happy. More significantly, over the last work, the rhythm section has the knobs turned up to eleven on this project. Drummer Lee Lamb is especially ferocious and precise on Age of Annihilation and Skaro. Beyond the plundering rhythm section and Mr. Box's tasty guitar licks, all songs favor an abundance of compositional hooks that make Heretic Nation a magnificent rush of entertainment. Beyond the aforementioned pieces, also delve into the magnificent Delusion, Killing Time, and Powers That Be for a head-spinning injection of melodic metal. Strongly recommended. Edward Box's Vendetta betters themselves yet also continues the melodic heavy metal mission on the excellent Heretic Nation. Box's thrilling fret fireworks is bolstered by a hearty and improved rhythm section for a tighter, more intense sound. Crackin' good stuff!